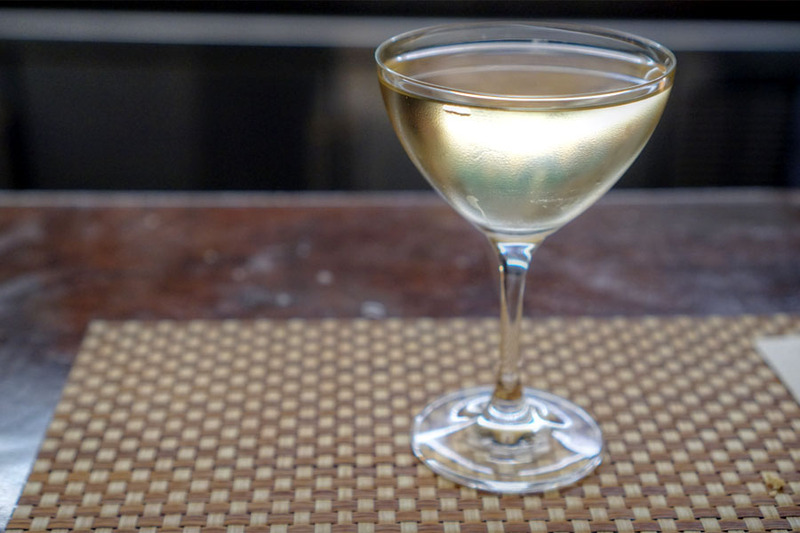 As regular readers will attest to, I do enjoy my cocktails, and given that Columbia Room is oft considered the best cocktail bar in the District, I knew I had to give it a go. This was especially true since Head Chef duties here are handled by Johnny Spero, whom I last saw over at Minibar. 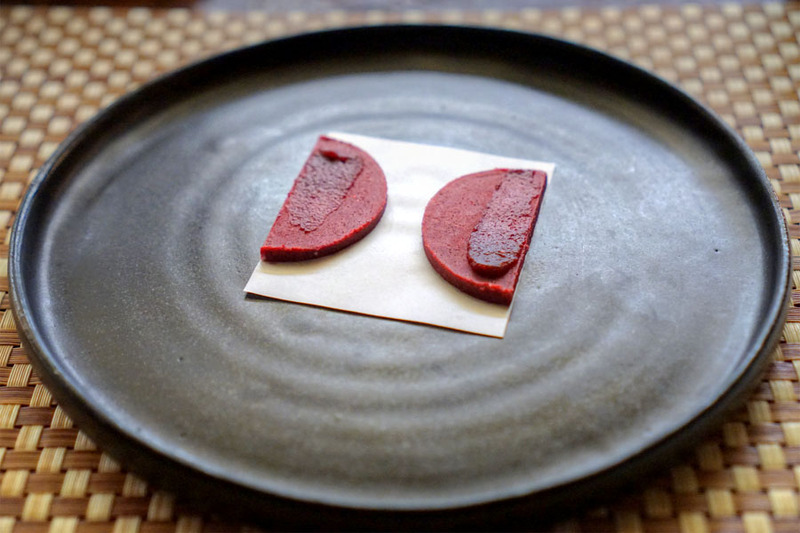 He ended up leaving the restaurant in 2015, and spent a year staging at Andoni Luis Aduriz's much-lauded Mugaritz before returning Stateside. 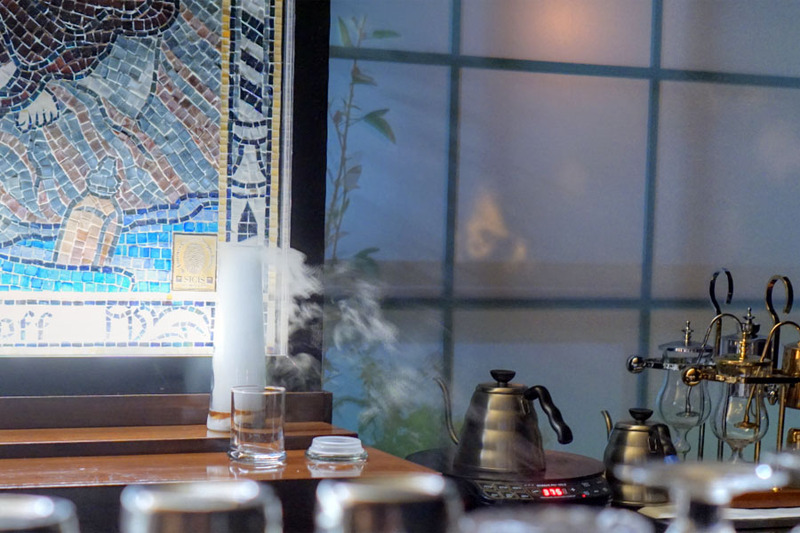 Columbia Room comes to us from noted barman, alcohol historian, and DC native Derek Brown. 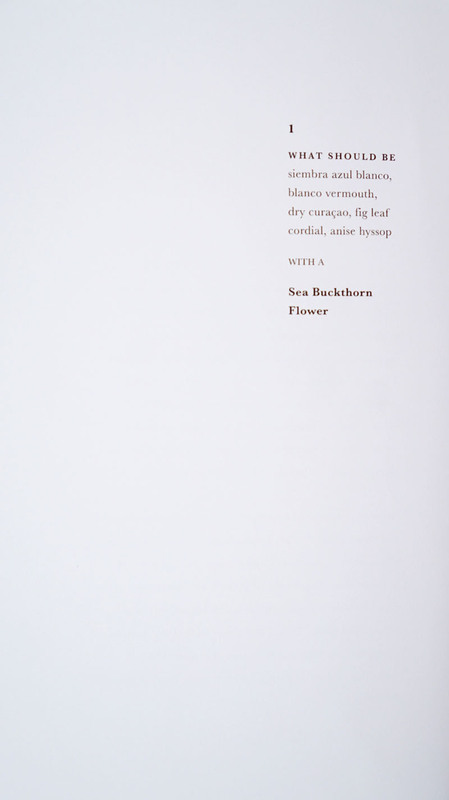 Brown built up an impressive résumé as a sommelier at Frank Ruta's Palena, Michel Richard's Citronelle, and Johnny Monis' Komi before branching out into the cocktail side of things. 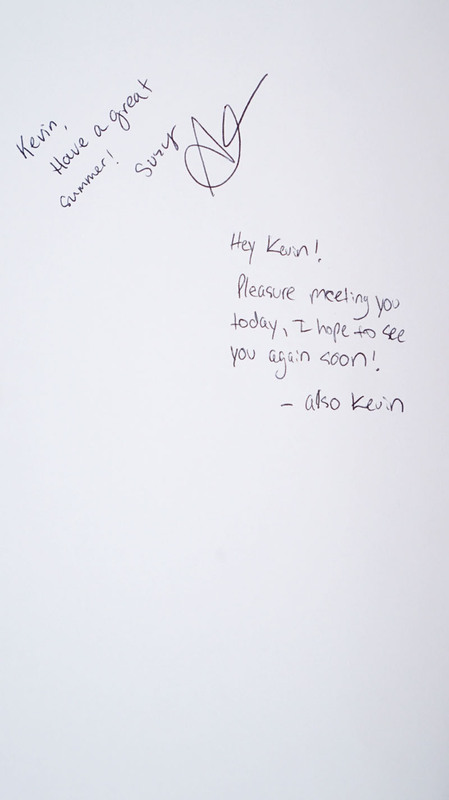 During his time at Komi, he co-founded underground cocktail bar Hummingbird to Mars, and in late 2008, helped open The Gibson. In November 2009, Brown and his brother Tom, along with Paul Ruppert, debuted The Passenger, a wine bar that eventually turned into a cocktail bar. In the back of The Passenger was Columbia Room, a 10-seater tasting counter that dropped in March the following year. Not long after, in April 2010, Brown partnered up with Angie Fetherston (née Salame) and founded Drink Company. 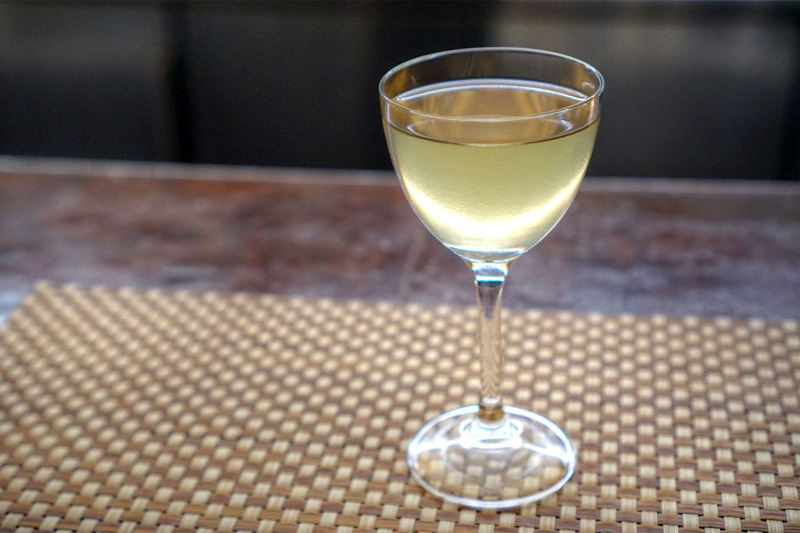 The two launched Mockingbird Hill, a sherry-focused bar, in June 2013. This was followed by oyster bar Eat the Rich in October 2013, and Southern Efficiency (focused on Southern whiskey) in December that year. At the start of 2015, Columbia Room and The Passenger both closed. The former re-opened in February 2016 at its current location, while the latter returned months later, but under the sole ownership of Tom Brown. The day-to-day at Columbia Room is handled by Beverage Director JP Fetherston (husband to Angie), while tonight I was served by Head Bartender Suzanne "Suzy" Critchlow. 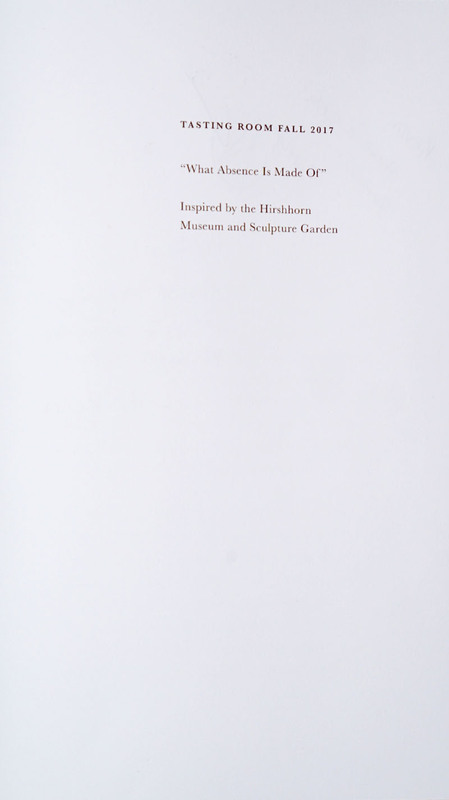 Critchlow, for her part, graduated with a crafts degree from Virginia Commonwealth University in 2007. She started out in 2008 at New York Deli in Richmond, VA, and worked there for over five years before joining the teams at The Rogue Gentlemen and Postbellum (both also in Richmond). In January 2015, she became Bar Manager at Mike Isabella's Graffiato in Richmond, and in September that year, moved over to Graffiato's DC location. Critchlow stayed until April 2016, when she left for Columbia Room. She was assisted this evening by bar-back Kevin, a former retail worker who's last gig was that of a server at Clyde's. Columbia Room is comprised of three distinct spaces. The first is the Punch Garden, which is what you see when you first walk up the stairs. There's open seating here for about three dozen guests, and both drink and food are ordered à la carte. 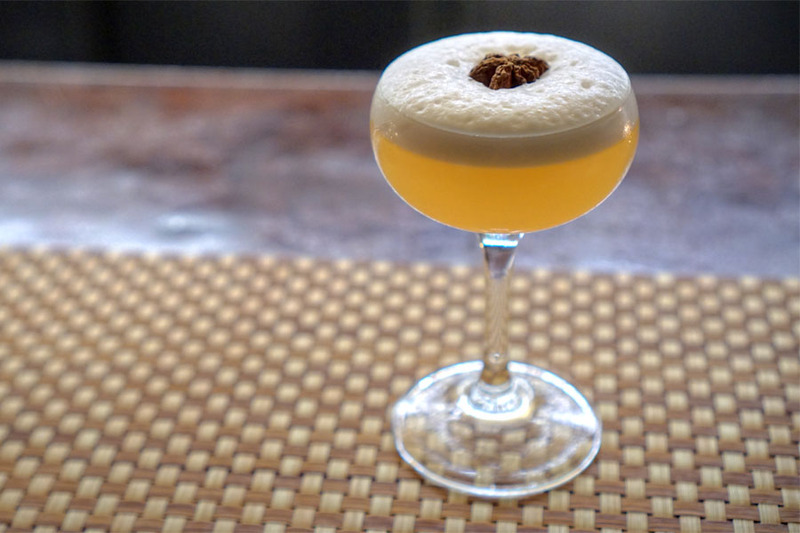 Managed by Dante Datta (Rasika West End), the Spirits Library is a bit more formal, but both food and cocktails are still available à la carte. 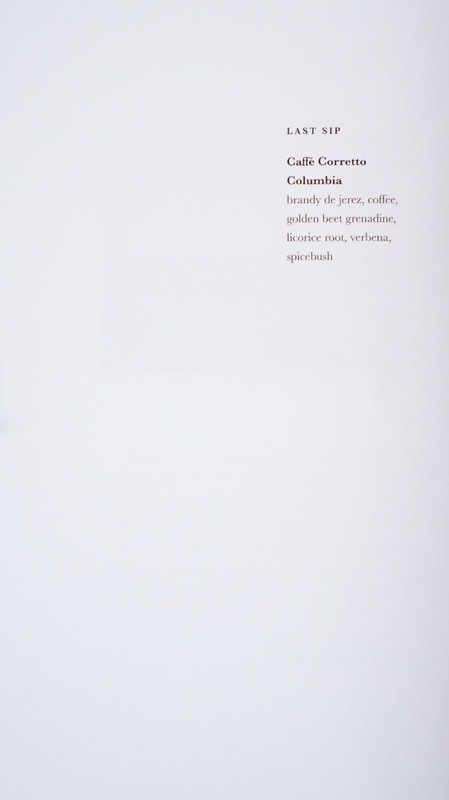 The Tasting Room is Columbia Room's flagship experience. There's seating for up to 18 guests at the bar, and menu options are either a three- or five-course cocktail tasting, paired with small bites. 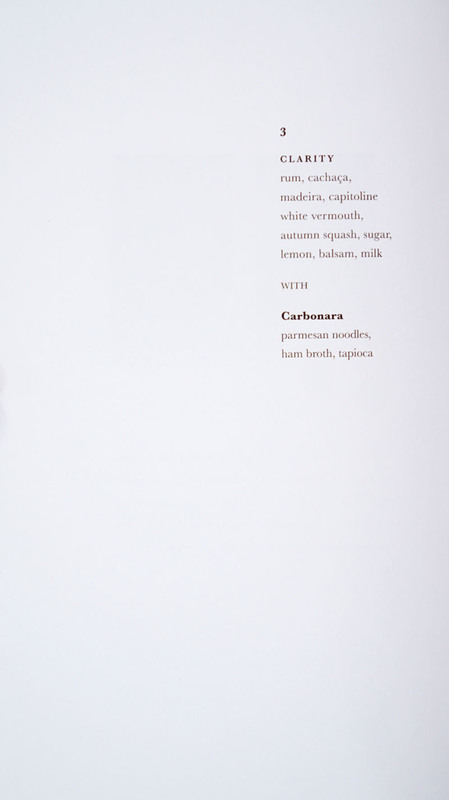 Tickets are available on Tock for $79 and $108, respectively (inclusive of gratuity), and there are also add-ons for Champagne ($30), osetra caviar ($100), and canelés ($20). 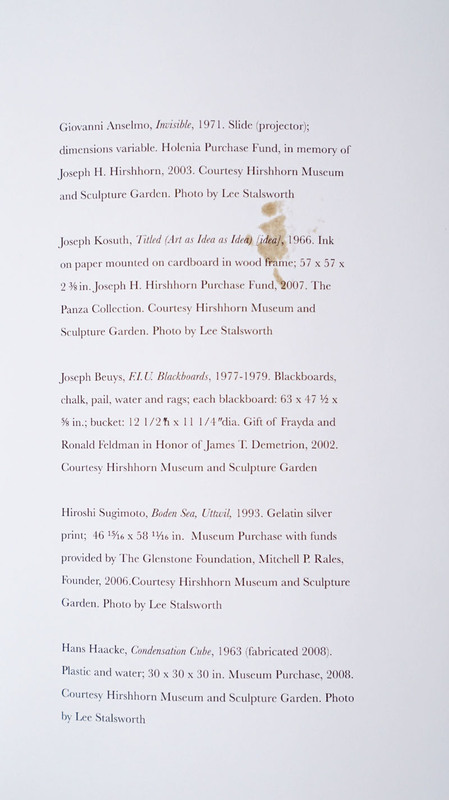 Tonight's menu was entitled "What Absence Is Made Of," and was inspired by an exhibit of the same name at the Hirshhorn Museum and Sculpture Garden. 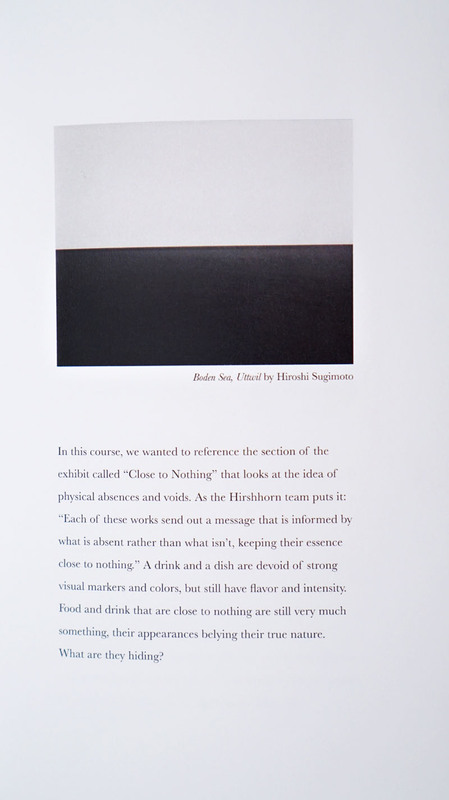 That exhibit actually opened the day before, and features works exploring the use of absence in art. 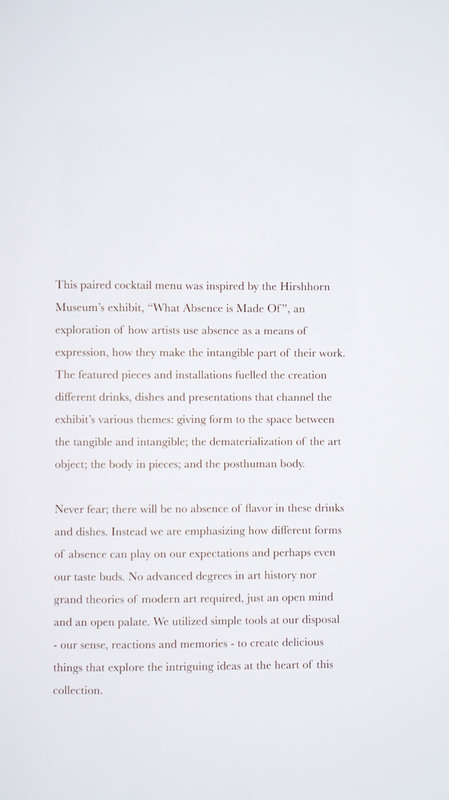 The idea was to use the exhibit as a jumping off point to create cocktails and food highlighting different forms of absence and how that can affect expectations and perceptions. Click for larger versions. 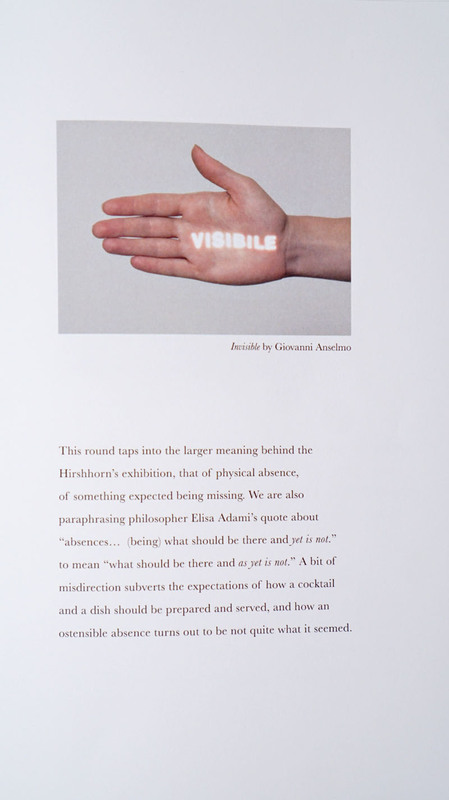 Our first course was a play on absence and expectations. Contained in a vase with some non-edible greenery was a flower-shaped chip of dehydrated blood orange with a dollop of sea buckthorn purée, which I was instructed to consume immediately. I found it crunchy, brittle, sticky, with a tart fruitiness that sort of lingered on your palate. The greenery was then removed, and the vase emptied of its contents, which I admit did manage to surprise me a bit. The cocktail displayed a woody, vegetal nose, not surprising given the tequila. Its taste, however, belied the bouquet, instead giving me softly bittersweet, subtly spicy nuances in a complex, contemplative package--you could say that there was an unexpected absence of tequila. 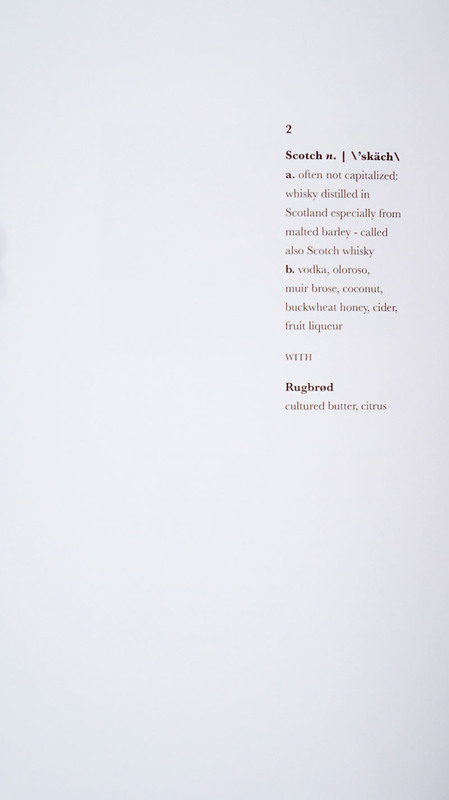 Next was a play on the "idea" of scotch, a sort of faux whisky recreated using vodka and a bevy of other ingredients. 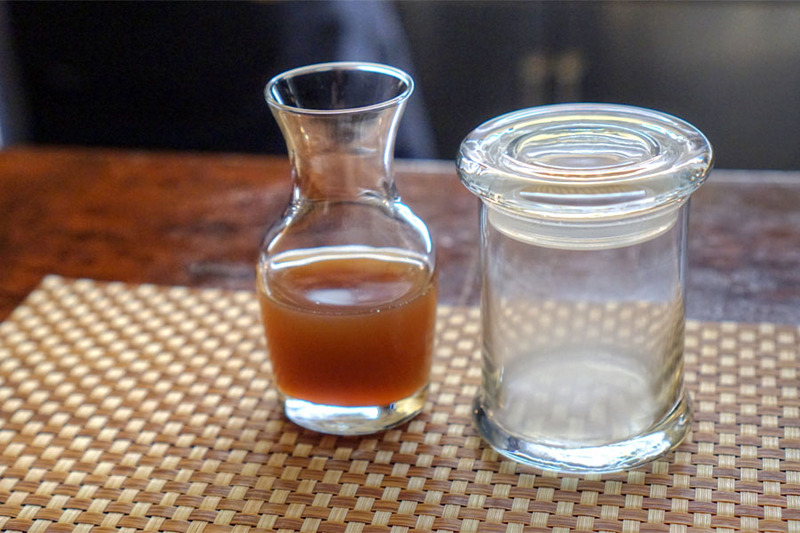 I was instructed to pour the contents of the carafe into the vapor-filled glass. The resulting concoction featured aromas that were strong on the smoke and sherry, with dark fruit and oxidation also coming to the fore. 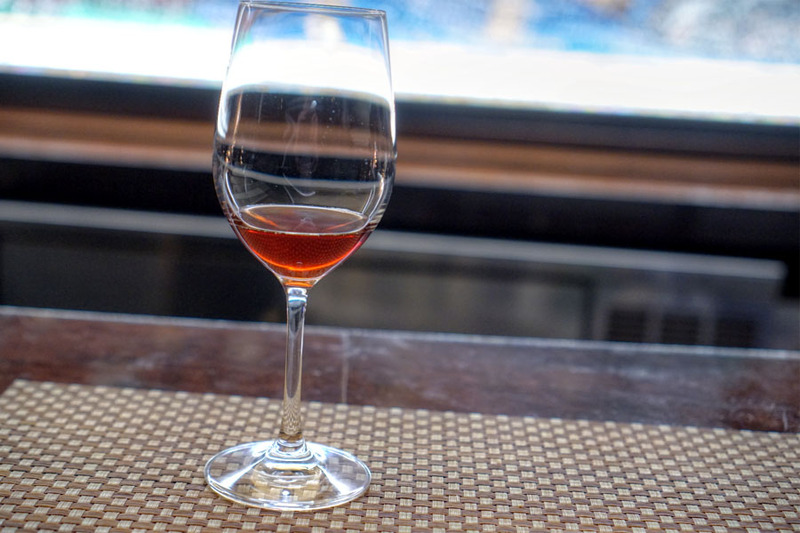 The palate, meanwhile, displayed large amounts of stewed fruit, along with nutty-oxidative notes once again from the sherry and a touch of sugariness from the buckwheat honey. I'd say that the cocktail effectively showed off some of the components of scotch, though I wouldn't necessarily confuse it for the real deal. 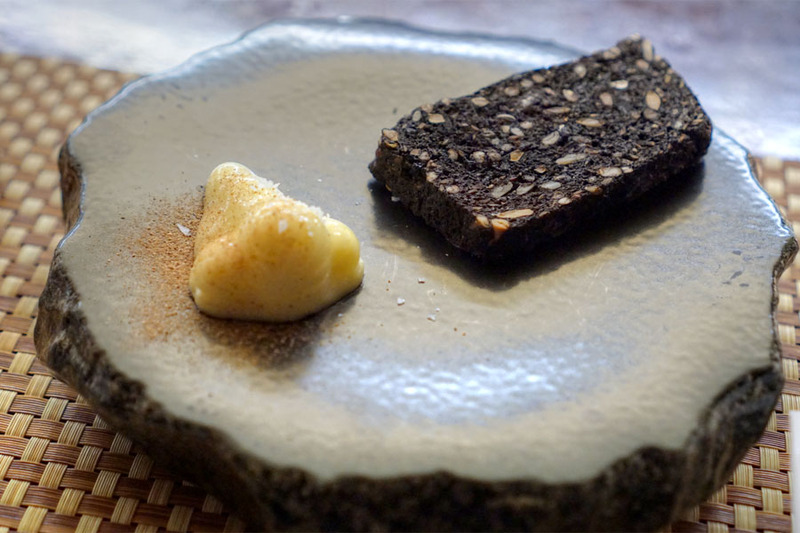 Accompanying the drink was a traditional Danish bread, made darker than usual courtesy of squid ink and cacao and studded with rye berry, flax, and sunflower seed. 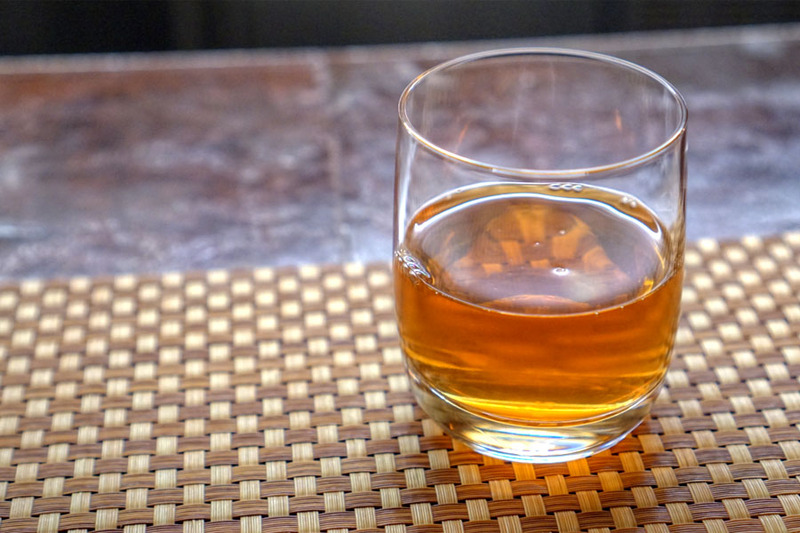 It was tough to the bite, a gritty, rustic bread with roasty, nutty flavors that seemed to bring out the sweetness inherent in the cocktail. Also on the plate was a nose-shaped mound of goat butter dusted with citrus powder and sea salt, a visual play on the "Body in Pieces" section of the Hirshhorn exhibit. The butter ate soft and delightfully salty, and managed to temper the somewhat harsh nature of the rye bread. 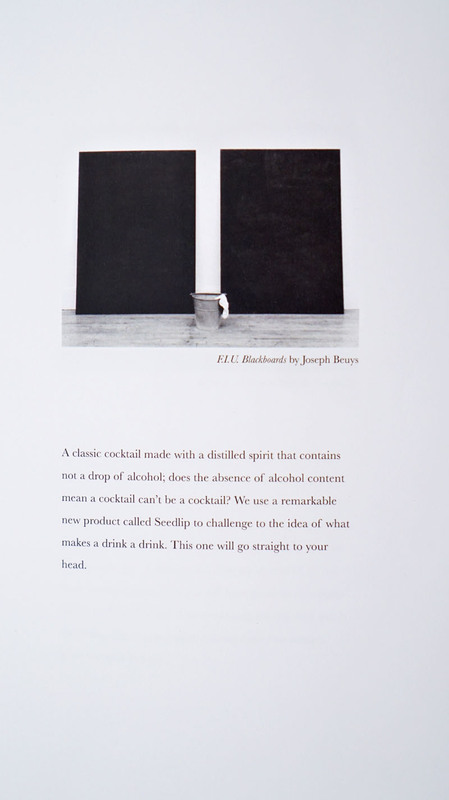 Following was a cocktail that was designed to question the very meaning of the term. 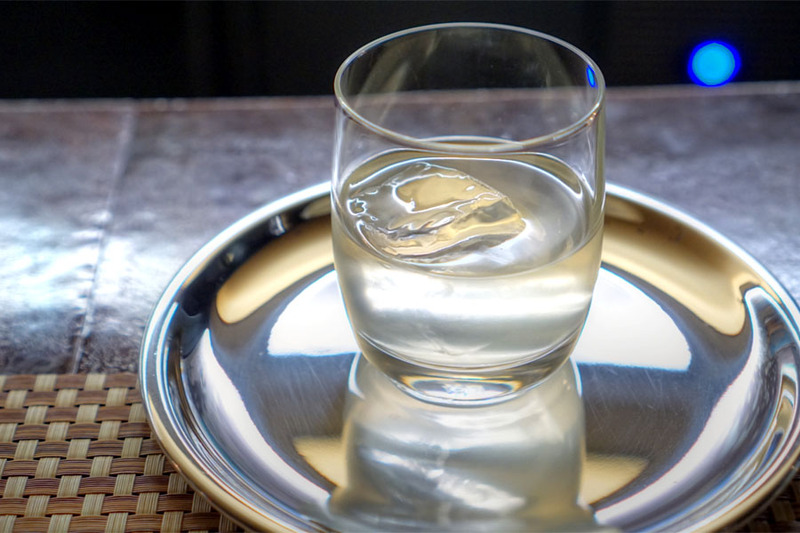 Does a cocktail necessarily contain alcohol? I'd say it depends on your definition of "cocktail." 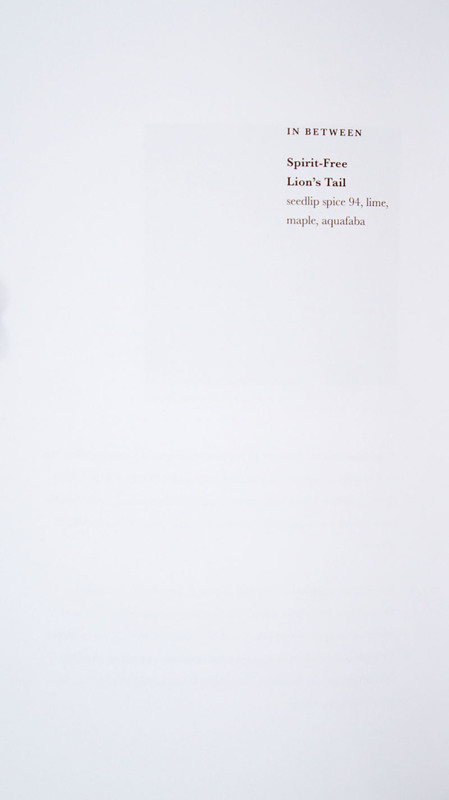 In any case, this was a riff on the classic Lion's Tail, which traditionally features whiskey and allspice dram. 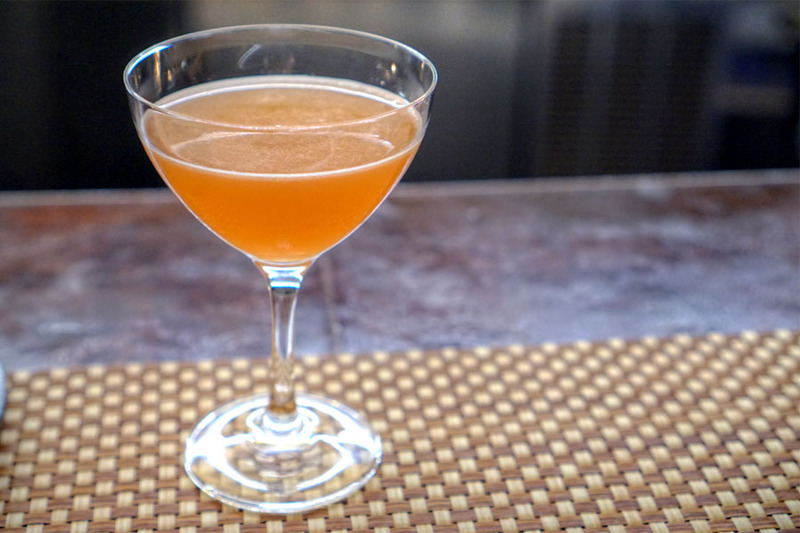 The version tonight was based on a non-alcoholic distilled spirit and an allspice-infused maple syrup. Nose of intense baking spice with pricks of star anise. The taste followed, displaying more sweet spice along with a ginger-y zest and plenty of citric character. I also sampled the Seedlip alone, which Critchlow likened to a "really intense water," one filled with bountiful amounts of floral spice. 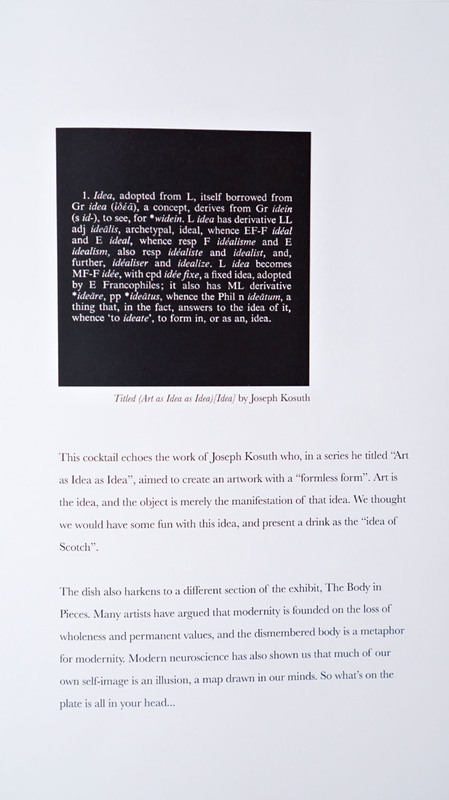 Here was a reference to the exhibit's exploration of voids, incorporating both drink and food that were visually unstimulating, but still packed plenty of punch. The cocktail was a clarified milk punch comprising Banks 5 Island rum, Avuá Amburana cachaça, fresh squash and pumpkin juices, lemon, balsam tree sap, and milk of course, all left to sit overnight, separated, and strained. It smelled very apropos for the season, delivering a comforting amount of sweet, autumnal spice on the nose. The taste, meanwhile, had a sweet, milky character and again more fragrant spice, along with a subtly oxidative element that I enjoyed. 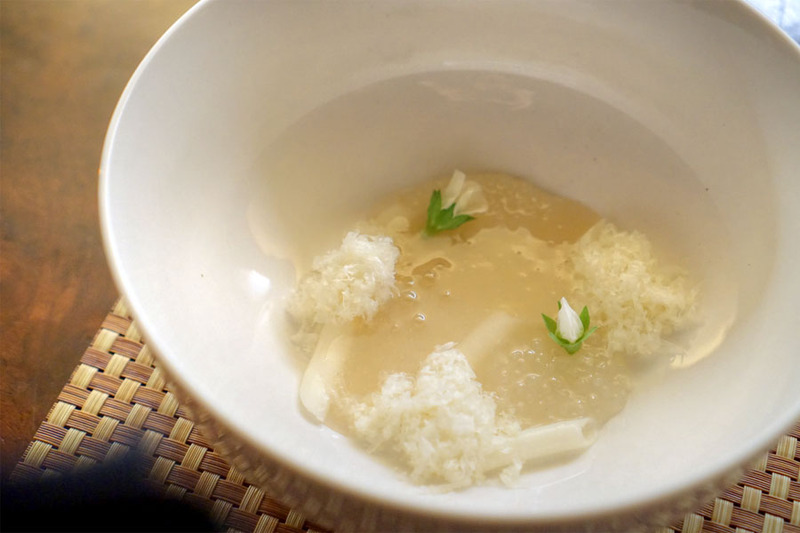 Accompanying the cocktail was a bowl of "noodles" frozen in liquid nitrogen with gluten, Idiazabal cheese, tapioca pearls marinated in corn stock, pea blossoms, and a Benton's bacon stock. It was indeed a cozy, satisfying dish, delivering lots of cheesy goodness alongside a rich, hammy broth and a light, herbal, floral note from the blossoms. Nice texture from the tapioca, too. 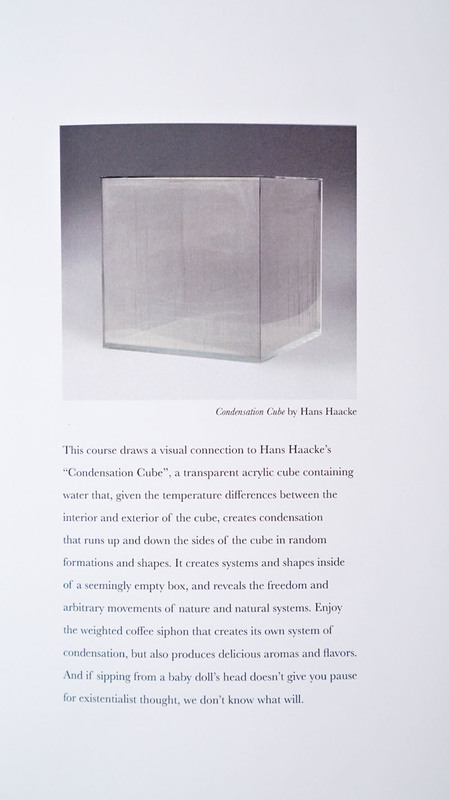 The tasting ended with an homage to Hans Haacke's "Condensation Cube." 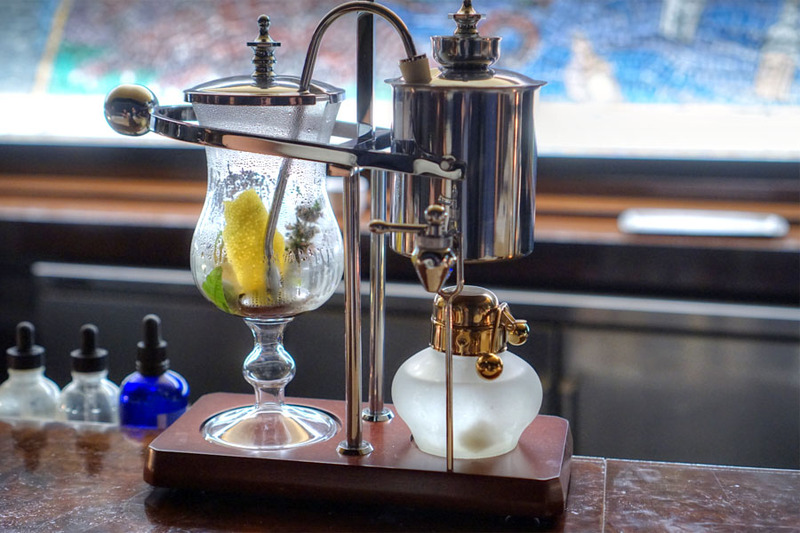 It featured the use of a Nispira coffee siphon, which flash-infused the cocktail with citrus peel, anise hyssop, and lemon verbena. I found the concoction very appropriate for the cold weather, with its roasty, chocolatey, grainy aromas leading to flavors of dark fruit, warming spice, sherry, and more roast and cocoa. 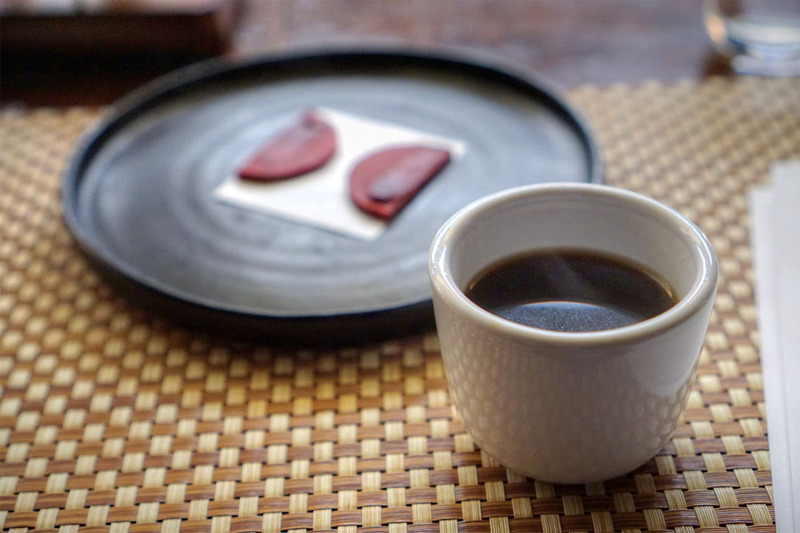 Along with the "coffee" came beet root-licorice cookies. Think gritty, earthy, with a sweet-yet-astringent character. 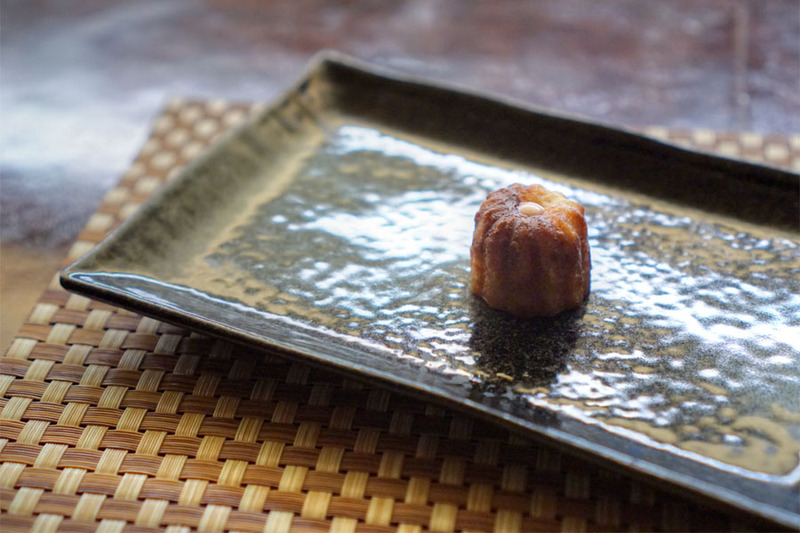 Last up was a single eggy, caramel-y canelé that I quite enjoyed. 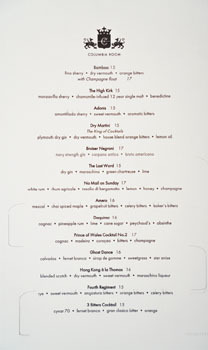 With the tasting completed, I was presented with a number of other menus. 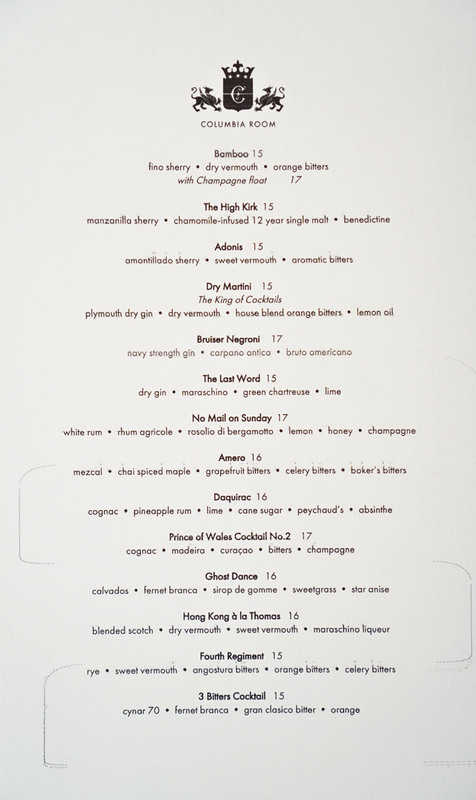 First was the à la carte cocktail list from the Tasting Room, featuring over a dozen drinks. This was followed by the menus from the Spirits Library and Punch Garden, both of which feature (the same) food. Click for larger versions. Given all the cocktails I was having, I made sure to order plenty of food to go along. 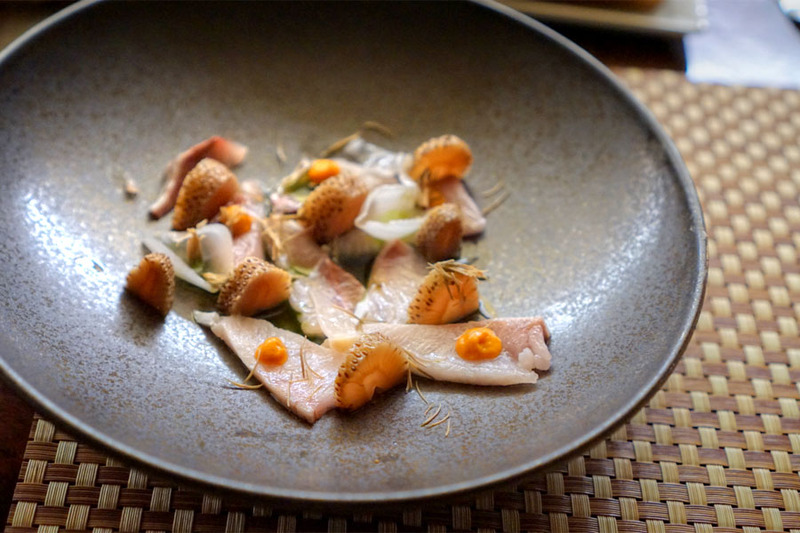 Yellowtail was characteristically fatty, while the piquant combination of spruce, strawberry, and sea buckthorn served as a sharp contrast to the fish. I began my second part of the evening with this hybrid of a daiquiri and a Sazerac. It smelled of light citrus, but with a distinctly sugary underpinning. The taste went fruity at first from the pineapple, then transitioned to more astringent, bitter, herbal notes before finishing with the essence of cognac. Spero's take on grilled cheese was fairly classic, as well as comforting--sort of what you want when consuming large amounts of booze. The combination of cheeses was interesting, and had a smoky, almost truffle-y musk to it. Next was my favorite of the à la carte cocktails. Nose of wonderfully fragrant sweet spice and light smoke. The taste was bittersweet, herbal, with again a touch of that smoky character all beautifully layered over a base of apple brandy. 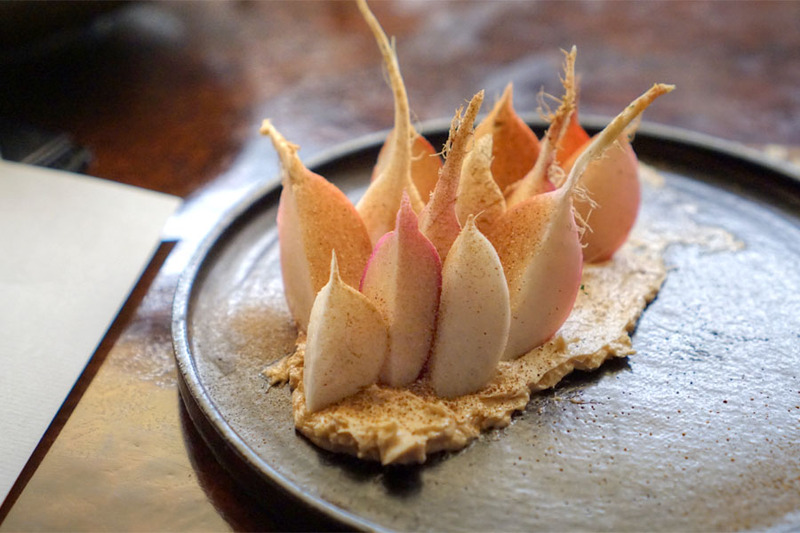 Radishes were spicy and hot, almost bracing in their bitterness, while the soy butter served as a super savory, creamy counterpoint. I actually made my own mash-up and ate the radishes with the sandwich above. 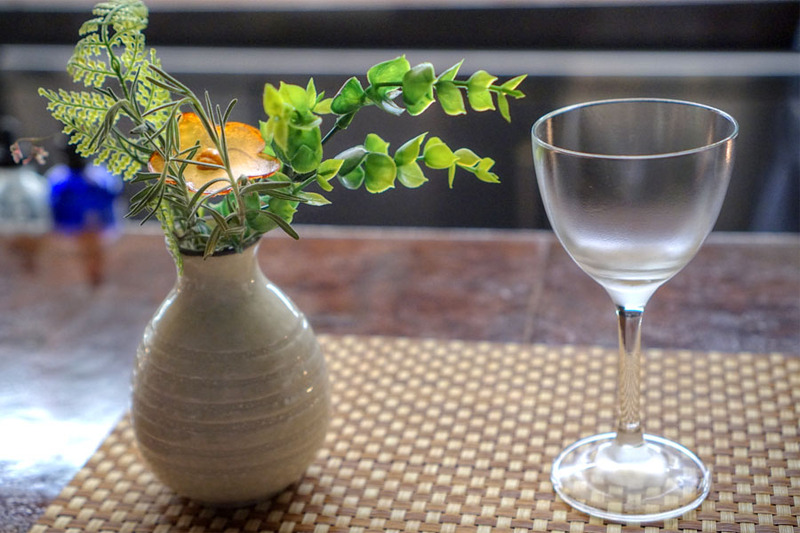 This version of the classic Bamboo cocktail was definitely on point. 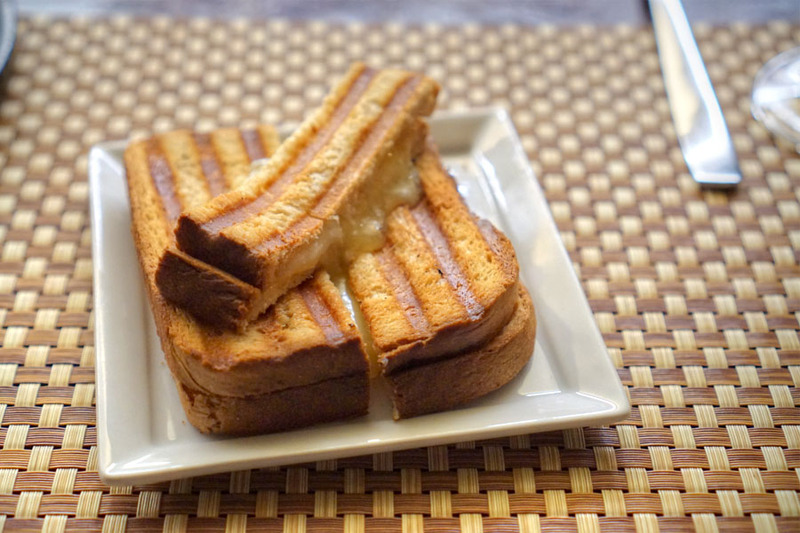 Thanks to the Champagne, I got a very pronounced toastiness in the aroma, which was joined by strong notes of apple. Taste-wise, this went in a nutty, oxidative direction, with the bitters and sparkling wine in the background. 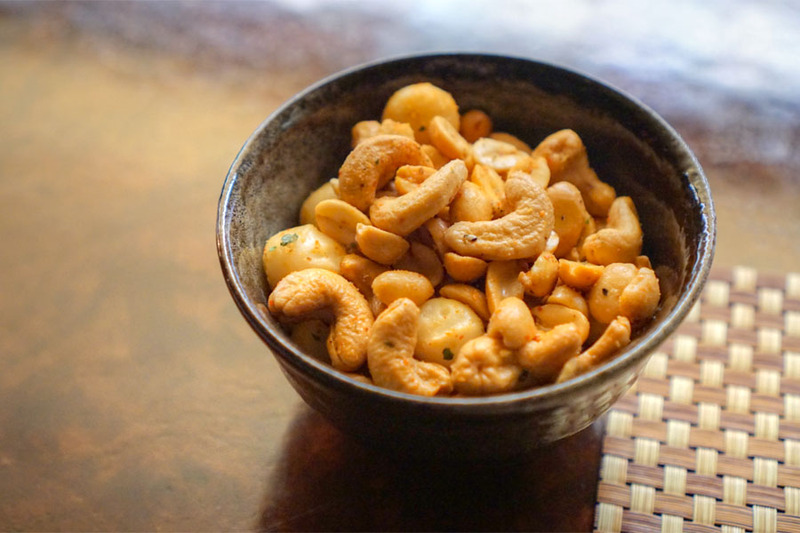 An aggressively-seasoned bowl of mixed nuts was a great take on the classic bar snack. 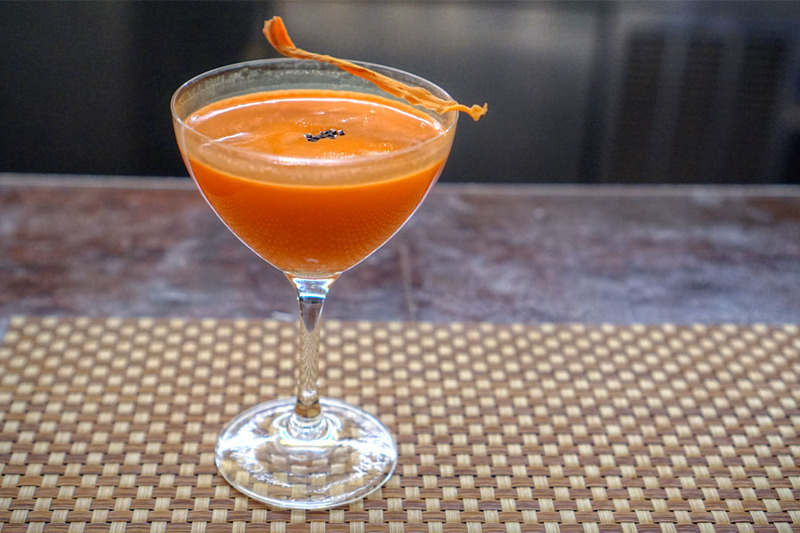 The robustly-hued cocktail showed off a nose filled with sweet carrot and baking spice. The palate had more carrot backed by a sesame-fueled nuttiness, along with the sting of alcohol and more spicy, gingery nuances all over the place. 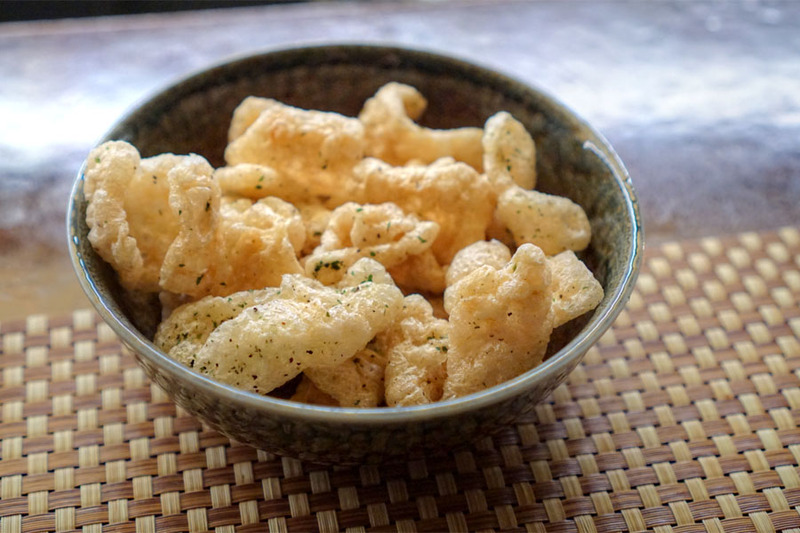 Chicharrones were spot on, coming out crisp and airy, with a slight tanginess to 'em. I ended the evening with a complementary taste of one of Critchlow's creations from the Punch Garden. A Pinot Noir-inspired drink, this one had a bouquet brimming with bright berry and a touch of booziness. On the tongue, I got more heat, spice, pepper, and huge amounts of strawberry, along with mint, herb, and an earthiness on the back end. Not surprisingly, I had a great experience at Columbia Room. 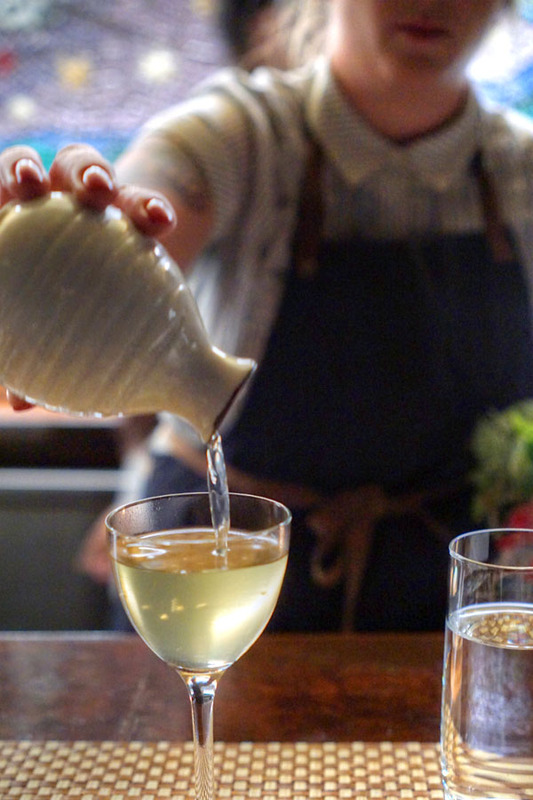 The cocktails were fun, and interesting, and contemplative, and tasty, an intersection of technique, creativity, ingredients, and whimsy that made for a very memorable time. Service was excellent as well (but also not stuffy at all), while the food worked, too. I can definitely see why everyone says this is the best bar in town. As for what's next for Drink Company, the group's working on a new restaurant in Georgetown called Reverie that'll be helmed by Chef Spero, so I'll certainly be on the lookout for that come 2018.